Make up your own recipe for a soda flavor all your own! Cooking activities, even simple ones like this, are filled with great learning opportunities. Along with measurement and math skills, kids can develop problem solving and literacy skills as well. Also, by showing kids that they can make tasty drinks that are much more healthful than store-bought soda, you will provide an opportunity to talk about making healthy choices in their diets. Flavor options are an important element of this activity – the more flavors you have, the more creative your students can be. Flavors like lemon juice, lime juice, orange, grape and apple juice work well. In addition, extracts from the baking aisle of the supermarket are great for this activity. Try vanilla and mint at the very least, but you’ll see that there are many more flavors to choose from. If using extracts, they should be used by your students in DROPS, not spoonfuls—they are very strong. You should either provide eyedroppers or, if possible, pour extracts into dropper bottles. Juices can be measured in spoonfuls. Pour the sugar into several cups that will be placed on students’ tables. Food coloring is messy – have one station where students can use food coloring, and place newspaper placemats underneath the food coloring. This activity is the first in a series of Soda Science activities. Try the others after doing this one. Ask your students to name some of their favorite flavors of soda. Write these soda names/flavors on a piece of chart paper or chalkboard. There are a lot of flavors! How did people come up with these flavors? Have any of your students ever made up a recipe at home before? What did they make? Was it great the first time, or is there anything they’d change about the recipe to make it better? Can you invent a new flavor of soda? Divide your students into teams of 2 or 3. Show your students the materials they’ll have to work with – water, sweetener, flavoring and color. List all of the different flavors they’ll have to choose from. Have children talk in their teams about what flavors they might try. They are free to mix and match flavors all they want. In this first activity, just use fresh water – since students will be making recipes, pouring them out and making changes, it’s less expensive to simply use tap water at the beginning – you will introduce carbonated water later on. Describe the soda-making process to them. The clear cups that each team gets are to be used for mixing their soda in. The small Dixie cups are to be used to taste their sodas – children should not be drinking out of their mixing cups, but rather pouring small amounts into the Dixie cups to sample their creations. Before they make their first recipes, tell them there is one rule – they should measure out 100 milliliters of water using a measuring cup. Every other ingredient is up to them, but everyone will use the same amount of water to make their sodas. Place the sugar cups on each table with a spoon in it—using only this spoon for the sugar will keep children from using wet mixing spoons. Before you send the teams off to make their sodas, tell them that they should write down every recipe they use, and any changes they make to them. After 10-15 minutes, stop your students and bring them together to share their observations with each other. How are they measuring their sugar? Look for a discussion about “leveling off” the spoonfuls so that the measurement is consistent. Does the food coloring make a difference in the taste of the drink? Can they make changes to their recipes to make them even better? Would they like to try a whole new recipe? This discussion should last no more than 5-10 minutes. After the discussion, have your students go back to their teams and try to perfect their recipes, or try all new ones. This first session is all about messing around and trying different flavors – the second session should be more focused on choosing one recipe and perfecting it. As with any cooking activity, be aware of your students’ dietary restrictions. Since this activity uses sugar, make sure to have alternatives available if any of your students can’t have sugar. This activity does use sugar (though you can certainly try it without the sugar), so the results are not as healthful as 100 % pure fruit juices. The concoctions WILL however have much less sugar than sodas (and many “fruit juices”) sold in stores. Many “fruit juices” only have a small amount of juice in them—the majority of each of these drinks is made up of sugar (which includes high fructose corn syrup) and water. 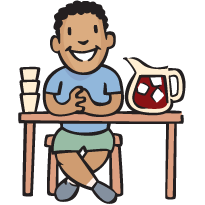 When students have their recipes, try comparing sugar amounts by looking at the labels of store-bought sodas and fruit juices. Which has more sugar—their home-made recipes or the store bought version? After doing this activity, try the Soda Science – Improving Your Recipe (click here).